Toyota is the undisputed leader in hybrid technology, while Ford is the pick-up truck’s leader. The Ford F-150 is a perennial best-seller in America, and so is the Prius in Japan. But that was not enough. No large hybrid pick-up truck never went beyond the prototype stage at either manufacturer. Only GM sells an hybrid truck, the Silverado. That Silverado hybrid has never been a big seller, yet this is the truck that both Ford and Toyota have in sight. The 2 companies have signed a memorandum of understanding (MOU), where they agreed to work together as equal partners, to develop an hybrid system for big rear-drive vehicles, like light trucks and SUVs. That technology will have to be “open” so that an electric motor may be shared, but the 2 manufacturers will not use each other’s ICE engine. You won’t see a Toyota Tundra with a Ford gas engine, or a F-150 with a Toyota V8. Vehicles will also remain different. This is strictly a part-sharing agreement. There is a precedent. In 2004, GM joined forces with the Daimler group, and later BMW, for exactly the same reasons. The hybrid version of the BMW X5, the Cadillac Escalade and Chevrolet Tahoe all share their hybrid parts and architecture with the Mercedes ML450. That last one was recently discontinued, and few people miss it. 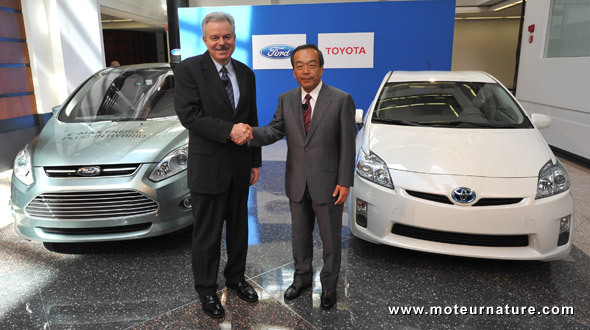 The Ford-Toyota agreement should be more successful, as it should come on more affordable models. Yet nothing has started. A final agreement (beyond the MOU) should not be signed before next year, and no development will begin before this.